Maptech_.TTF font is not installed. 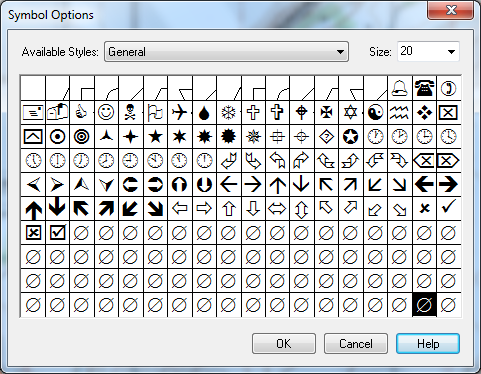 To correct this, download the MAPTECH_.TTF file below and install it into the C:\Windows\Fonts folder on your PC. Click the link below. In most instances, your web browser will ask if the file should be Opened, or Saved to your computer. Choose Save, then select a location to Save the downloaded file In. If you are unfamiliar with downloading and applying software patches, we recommend choosing your "Downloads"; select Save In, Downloads and press Save. Once the download completes, double-click the downloaded MAPTECH_.TTF file that appears in your Downloads folder. This will show the font symbols. Press Install to add the MAPTECH_.TTF file to your PC, and apply it to your Terrain Navigator Pro installation. Once that process is completed, you may run Terrain Navigator Pro, and delete the downloaded MAPTECH_.TTF file from your Desktop. Please note: The above directions apply to Windows 7 and Microsoft Internet Explorer. Those using other versions of Windows, or other browsers, may need to adjust these directions slightly and manually copy the MAPTECH_.TTF file into the C:\Windows\Fonts system folder. The MAPTECH_.TTF file will not install or appears to be installed already. How do I correct this Windows error? Sometimes Windows will erroneously report that a font is already installed, or Windows will indicate that the font can not be deleted, or indicate another sign of corruption. This can be verified by opening a command prompt and trying to delete the Maptech_.TTF file from the C:\Windows\Fonts folder. To correct this, try booting Windows in "Safe Mode" and then using the command prompt to delete the Maptech_.TTF file from the C:\Windows\Fonts folder. Then reboot in standard Windows mode and copy a fresh download of the Maptech_.TTF file into the C:\Windows\Fonts folder. Your IT professional can assist you with this procedure. This is not a procedure that a TNP support representative can undertake, as it involves a corruption within the Windows operating system.